This recipe was sponsored by Zaycon Foods. They provided me with a free case of chicken to review, the recipe and opinions voiced in this post are mine and have not been swayed. This month I was offered the chance to try out Zaycon Chicken for the first time, so of course I jumped on the opportunity! I have seen and heard of Zaycon so I was super excited to finally be getting some myself. I knew of the process of getting my case of chicken from browsing their website so many times in the past. I just always seemed to miss the order dates because of other things going on in my life. This time though…. This time I cleared my schedule and mad it a priority to make sure I was able to pick up my case. As I was dreaming of chicken the few days prior to picking up my case, I decided the first meal I was going to make was this super yummy Bacon Ranch Chicken. I knew that Zaycon Foods sold chicken and other types of meats, but did you know that they also sold bacon? I mean bacon by the case!!! The case, people!!!!! I already have plans on purchasing that when it comes to my area….Mmmmm bacon. I love the fact that the process of getting my case of chicken was soooo simple! You order online, choose your pickup location, pay, and then on the delivery you simply drive up and they put it right in your car for you! You never even have to get out, I did of course because I wanted to snap some quick photos. Rudy, the delivery man, was super nice and had no problems of me grabbing a few quick photos. He was also able to answer all of my questions. 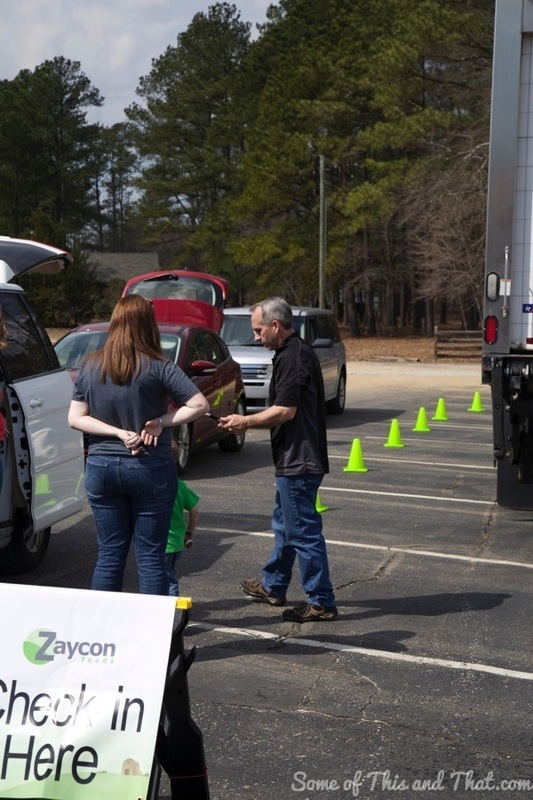 Did you know that Zaycon Foods provides fresh, high quality product, straight from our suppliers, cutting out the middle man and that they only sell in bulk? This means that you can get a great quality of product at a lower rate. My pickup site was a local church in my area, and as I was snapping photos, the director told me about their Facebook group where they come together and purchase cases to split between families. She then laughed because no one ever wants to split the chicken because they all want it for themselves. Ok, now back to that Bacon Ranch Chicken I mentioned earlier. I wanted something for dinner that was quick, easy and would make my family happy. Since the Zaycon freash chicken breast are fairly large (I’m talking bigger than my hand large), I decided to cut each breast into two portions. 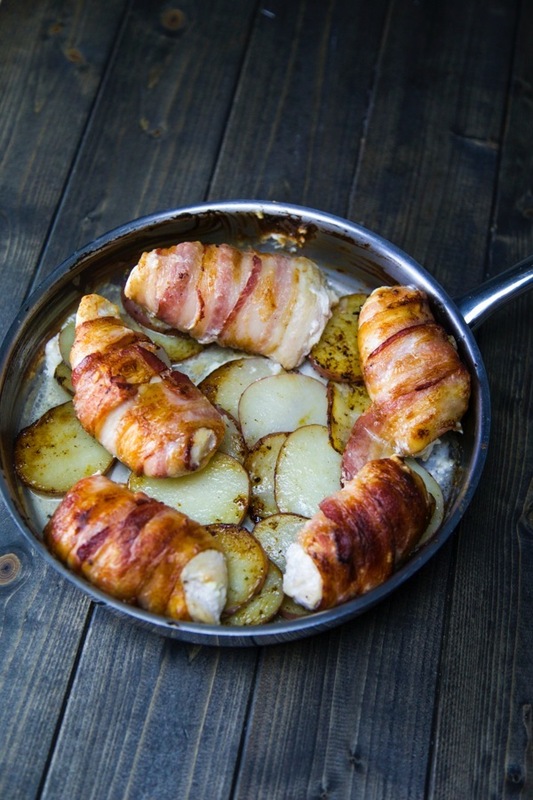 After that it is just a matter of adding a few seasonings, bacon and cream cheese to the mix… Oh and bonus, this meal only dirtied up one skillet! Once you have your chicken portioned out, sandwich it between some plastic wrap and use a meat tenderizer (or large spoon) to thin the chicken into about 1 inch thick. In a small bowl, combine the cream cheese and ranch seasoning. Spread cream cheese evenly over each portion of chicken, leaving a little room towards the edges to roll. 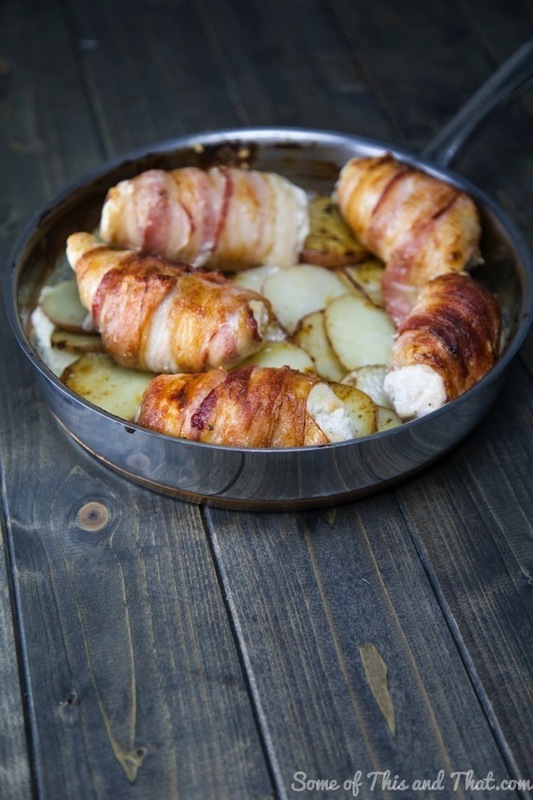 Roll each portion up and tightly wrap with bacon. 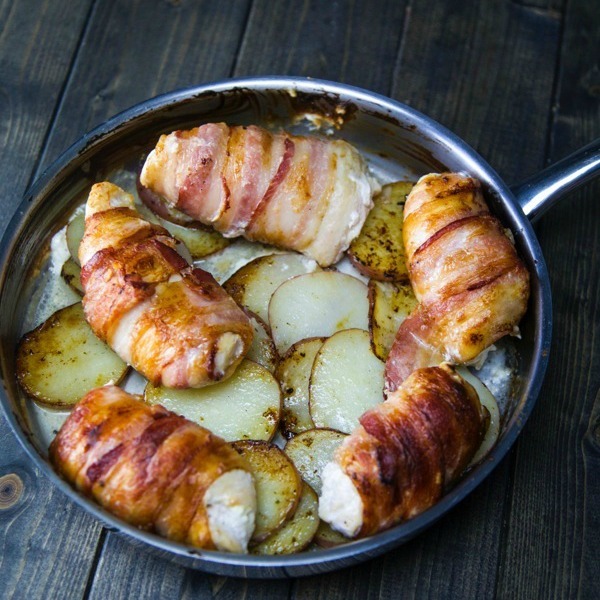 Place each portion of Zaycon chicken in a hot skillet with the seam of the bacon facing down. This will help keep the bacon in place without having to use toothpicks. Sear each side of the bacon until light golden brown ( about 2 minutes on each side). Place skillet into a preheat oven at 400 degrees and bake until chicken reaches an internal temperature of 165 degrees. This time may vary on the thickness of your chicken. After the chicken was done cooking, I removed it from the skillet and used the drippings to brown some thinly sliced potatoes. Let me tell you, this is probably my families new favorite meal. It is simple and easy to make and chicken comes out moist and juicy…. Plus… Bacon… Duh! What about you? 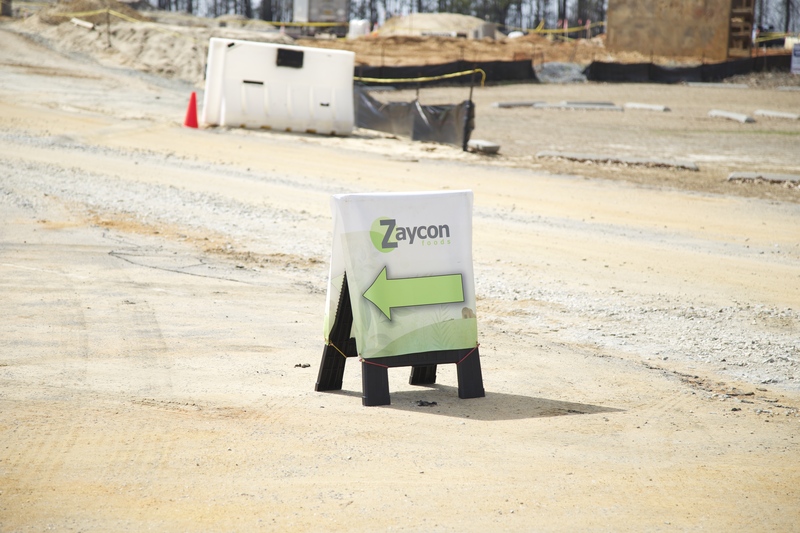 Have you ever tried any of Zaycon Foods products? Which ones have you tried or want to try? Let us know in the comments below! Sandwich each Zaycon Chicken breast between some plastic wrap and use a meat tenderizer (or large spoon) to thin the chicken into about 1 inch thick. In a small bowl, combine the cream cheese and ranch seasoning. 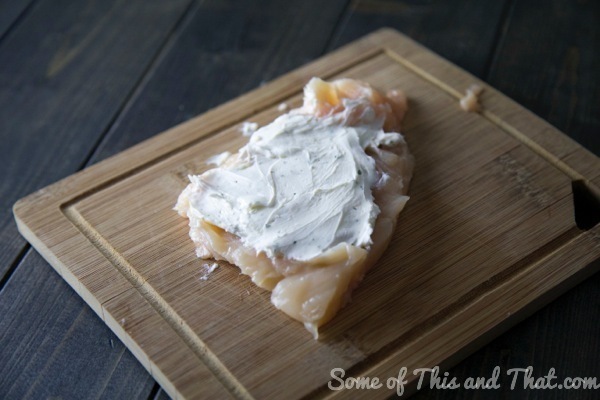 Evenly spread cream cheese onto each portion of chicken, leaving a 1/4 inch edge all around. 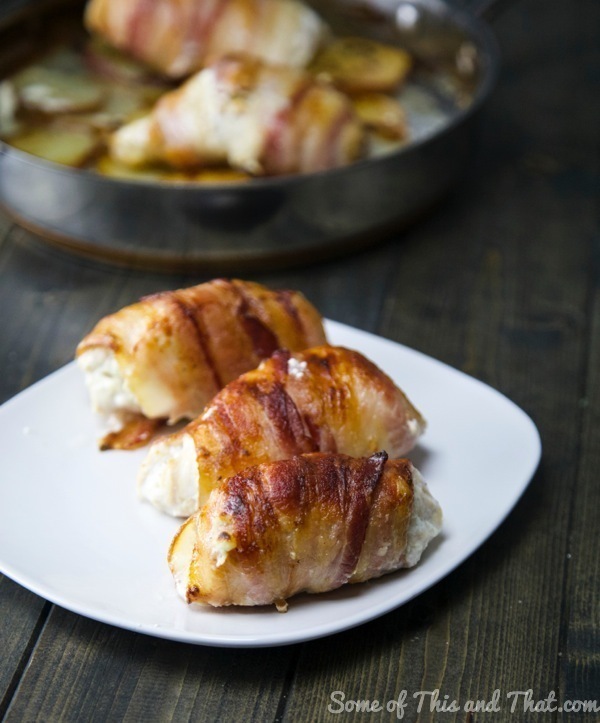 Carefully roll each portion of chicken and wrap it tightly with 1-2 sliced of bacon. 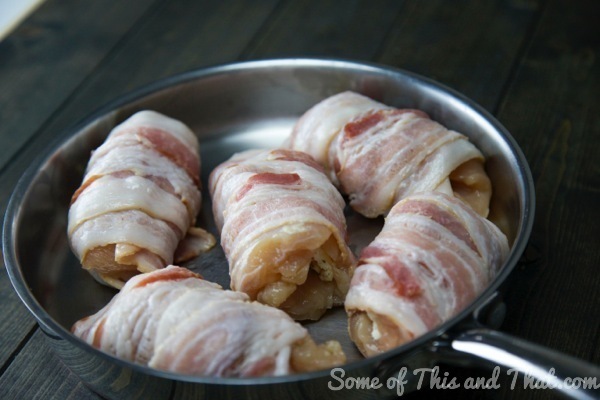 Place chicken, with the bacon seam down, in a hot oven safe skillet. Sear each side until bacon is light golden brown, but not completely cooked through. Place entire skillet into a preheated oven of 400 degrees. Bake until internal temperature reaches 165 degrees, about 15-20 minutes, depending on the size and thickness of the chicken breast.